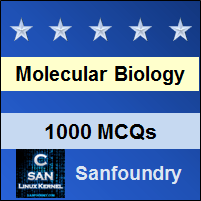 This set of Molecular Biology Multiple Choice Questions & Answers (MCQs) focuses on “Manufacturing the Message – 1”. 1. Without using primers for RNA synthesis the polymerase produces small stretches of RNA of _____________ nucleotides. Explanation: Without using primers for RNA synthesis the polymerase produces small stretches of RNA of 10 nucleotides. These transcripts are released from the polymerase which without dissociating from the template begins the synthesis of RNA again. Explanation: The transition from the closed to open complex involves structural changes in the enzyme and opening of the DNA duplex to reveal the template and the non-template strands. This melting occurs between positions -11 to +3, in relation to the transcription start site. 3. The isomerisation of σ70 of bacterial polymerase is an energy dependent process. Explanation: The isomerisation of σ70 of bacterial polymerase is not an energy dependent process. Instead isomerisation is the result of a spontaneous conformational change in the DNA-enzyme complex to a more energetically favorable form. 4. With respect to the formation of complex between polymerase and DNA template which of the following is correct? Explanation: Isomerisation is essentially irreversible thus open complexes are irreversible and once forms transcription will be initiated. But the closed complex is readily reversible and the polymerase can easily dissociate from the promoter and is not bound to transcribe the DNA. 5. How many channels are found in the RNA polymerase clamp? Explanation: The RNA polymerase clamp has 5 channels. They are NTP uptake channel, NT channel, T channel, RNA-exit channel and downstream DNA channel. Explanation: The channel that allows the exit of the coding strand is known as the NT channel. NT channel is the non-template exit channel. Non-template strand is also known as the coding strand. 7. Region 1.1 of the σ factor mimics the DNA and is negatively charged. Explanation: Yes, the region 1.1 of the σ factor mimics the DNA and is negatively charged. The space in the active center cleft which is either occupied by the region 1.1 or by DNA, is highly positively charged. Explanation: The first nucleotide added by the polymerase is always a purine. In this case adenine is more common than guanine thus ATP is the first nucleotide added. 9. The ternary complex is formed by the polymerase, DNA duplex and the nascent RNA. Explanation: The ternary complex is formed by the polymerase, single stranded DNA template and the nascent RNA. This is formed after the polymerization of atleast 10 nucleotides which stabilizes the structure. 10. After the binding of polymerase to the DNA template the σ factor is ejected. Explanation: No, the σ factor is not ejected right after the binding of polymerase to the DNA template. It is rather ejected after the addition of atleast 10 nucleotides. It has been seen to play some role in the addition of the first and second nucleotide and it cannot leave the complex during the transition of closed complex to open complex.